Two of the UFC's most dynamic and explosive strikers will meet in a fight fan's dream match, as former world champion Anthony Pettis moves to the welterweight division to face off with perennial contender Stephen "Wonderboy" Thompson. 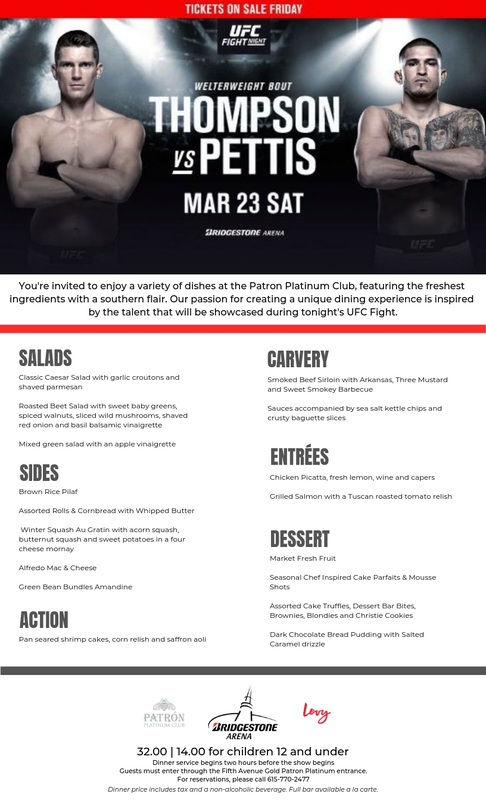 Owner of three consecutive post-fight performance bonuses, Pettis' reputation as a creative offensive force has earned him the nickname "Showtime," and he is determined to thrill Tennessee fans when he battles Thompson, whose five knockout wins in the UFC have made him a mainstay on highlight reels everywhere. Group rates of 20% OFF available for parties of 10 or more. Contact us at (615) 770-7800 or [email protected] for more details!